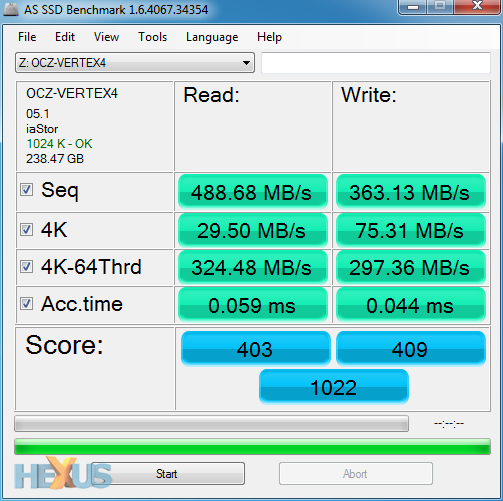 The OCZ Vertex 4 256GB averaged just 9.4% lower than the peak scores attained by the group leaders. This is an excellent result which ranks the OCZ Vertex 4 256GB near the top of the comparison list. The range of scores (95th - 5th percentile) for the OCZ Vertex 4 256GB is 46.3%. This is a relatively wide range which indicates that the OCZ Vertex 4 256GB performs inconsistently under varying real world conditions. Typical Vertex 4 256GB Builds (Compare 6,316 builds) See popular component choices, score breakdowns and rankings. Great drive, fast and reliable. Excellent Drive, been 2 years not a single issue ! This benchmark is an outlier, showing an incredible 133 4K write. The OCZ Vertex 4 comes with a 5 year warranty, OCZ are trying to make up for poor quality control on previous models... Time will tell, but on the face of it this is the best performing (benchmark wise) SSD you can buy today.